The prices for ebooks are $15 and for hard copies are $25. The thesis is only $5. * Discounts apply on purchase of multiple hard copies. 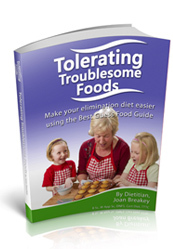 Tolerating Troublesome Foods is the latest book from author Joan Breakey. It contains the Best Guess Food Guide of over 300 foods. It will help you understand different levels of risk depending on changes in each food that affect your own tolerance. This allows you to expand your diet carefully to make it your own. Purchase Tolerating Troublesome Foods [Ebook] *When you purchase an ebook you will be immediately sent an email “Your Food Intolerance Pro Order is Complete”, with a download link. Check your email after making a purchase. Buy Tolerating Troublesome Foods [Hard Copy] *Available for sale in Australia only. Especially written for Parents and Health Professionals. Fussy Baby clarifies the key issues surrounding introducing your baby to solids and food intolerance. It also reveals new information about eating development and super-sensitivity. Fussy Baby will help you understand why your baby may be struggling and provides practical recommendations you can use immediately to start seeing big improvements. Purchase Fussy Baby [Ebook] *When you purchase an ebook you will be immediately sent an email “Your Food Intolerance Pro Order is Complete”, with a download link. Check your email after making a purchase. Buy Fussy Baby [Hard Copy] *Available for sale in Australia only. Are You Food Sensitive? outlines innovative and practical ways to help with many common health problems. Are You Food Sensitive will teach you how to become your own Diet Detective. You’ll quickly discover what the problem foods and food chemicals are that you’re reacting to so you can significantly reduce or even eliminate your symptoms. Learn about key concepts like The Total Body Load, Target Organ Sensitivity, Impacts of environmental chemicals, even the importance the role of your family tree plays. Many people put themselves on unnecessarily strict and boring diets because they aren’t certain of which food is actually causing the problem. After using the simple Diet Detective Method, you’ll know exactly which are problematic quickly. Importantly you won’t be eliminating foods you don’t need to and you’ll be able to enjoy a broader range of foods. Purchase Are You Food Sensitive [Ebook] *When you purchase an ebook you will be immediately sent an email “Your Food Intolerance Pro Order is Complete”, with a download link. Check your email after making a purchase. Buy Are You Food Sensitive [Hard Copy] *Available for sale in Australia only. Especially written for people who suspect they react to some foods, and for health professionals. 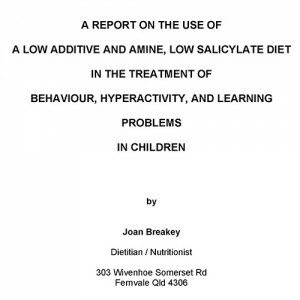 The Thesis on diet and behaviour and ADHD is the evidence base for much of the work done by Joan Breakey. The Thesis showing the evidence base is available in the eBook format for reference. It is generally bundled with the Professional Pack, but if you want you can purchase it separately here. Purchase Thesis on diet and behaviour and ADHD *When you purchase an ebook you will be immediately sent an email “Your Food Intolerance Pro Order is Complete”, with a download link. Check your email after making a purchase. The 50 page Practice Manual explains detailed diet therapy incorporating food chemical sensitivity as well as allergy. It is designed to give professionals confidence in each step of the process. Purchase the Dietitians Practice Manual [Ebook] *When you purchase an ebook you will be immediately sent an email “Your Food Intolerance Pro Order is Complete”, with a download link. Check your email after making a purchase. Buy the Dietitians Practice Manual [Hard Copy] *Available for sale in Australia only. The Professional Pack provides you with all the information you really need to manage the whole diet investigation process. It starts, from first contact to confidently having your patient manage their own or their child’s diet and most importantly seeing them get great results. There are many fascinating areas of dietetics explored. It includes Are You Food Sensitive, Fussy Baby , Practice Manual and Thesis on diet and behaviour and ADHD all in a single book. It provides a deep insight into this challenging and newly developing area – information that many professional training schools are not yet able to offer. Now you get the option to purchase the Professional Pack or select your own combination of books and avail the applicable discounts (on hard copies only). Purchase Professional’s Food Sensitivity Pack [Ebook] *When you purchase an ebook you will be immediately sent an email “Your Food Intolerance Pro Order is Complete”, with a download link. Check your email after making a purchase. 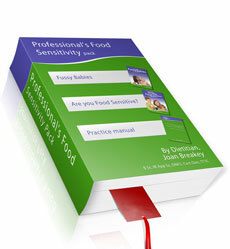 Buy Professional’s Food Sensitivity Pack [Hard Copy] *Available for sale in Australia only.